I always remember this Deptford pub as a child because it had the sign of a Centurion soldier but now I see it has been changed to a Ship. When was changed? Could it now represent the HMS Centurion a 60 gun ship of the line? She was built in Portsmouth around 1732 and I believe commissioned in 1734. As a part of the home fleet she took part in the expedition to Lisbon captained by Sir John Norris. In 1738 she was captained by George Anson and led a small squadron to the African coast then to Jamaica and back to England. In 1740 she started her famous circumnavigation being the only ship to survive the entire voyage and capturing the Spanish galleon Nuestra Senora de Cavadonga. After being cut down to a 50 gun ship she took part in the first battle of Finisterre. In 1769 she was broken up at Chatham. I always thought the pub had the sign of a centurion soldier as the photo on the left shows, taken in the 80’s just after the pub caught fire. Maybe the name was changed then? 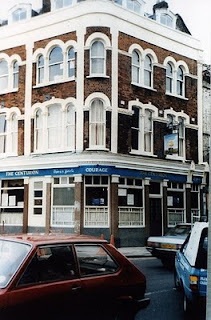 The Centurion did have a centurion on the sign in thw 1980's. I dont know when they changed it, probably after the pub got burnt out. 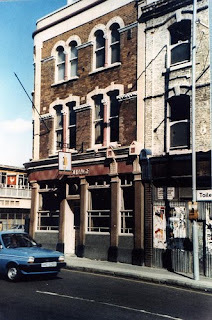 Heres a link to a photo showing the pub in August 1985. Thanks for that Matt, I always thought I knew it had a picture of a centurion on it way back in the 50's and probably before. Tell me Matt do you have any info or pictures of another pub which has long since gone. It was the King of Prussia in Union Street now Albury Street? I dont know anything about the King of Prussia, it must have been closed for many years. I have found some info but unfortunately no pictures. the following link may be of interest. Sorry - Centurion not Century - so much for a computer that thinks it is e my spelling mistakes!